Tel Aviv from Noam Armonn on Vimeo. Tel Aviv is my home town. It is where I was born 47 years ago. 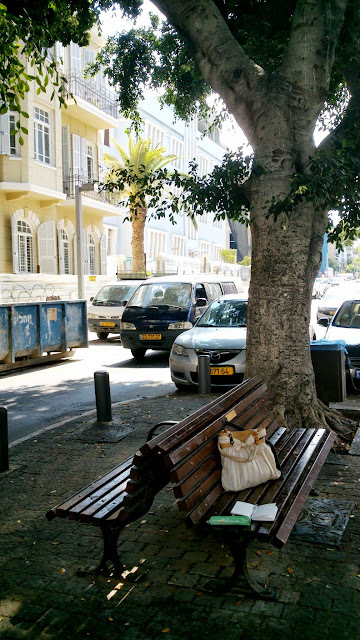 I love this city even though I have decided to leave it 14 years ago and raise my family some 150 km norther, in a small place surrounded by nature called Michmanim. I'm happy to present you with my latest timelapse film. Thank you so much Noam for creating this amazing video and for allowing me to share it on the blog! 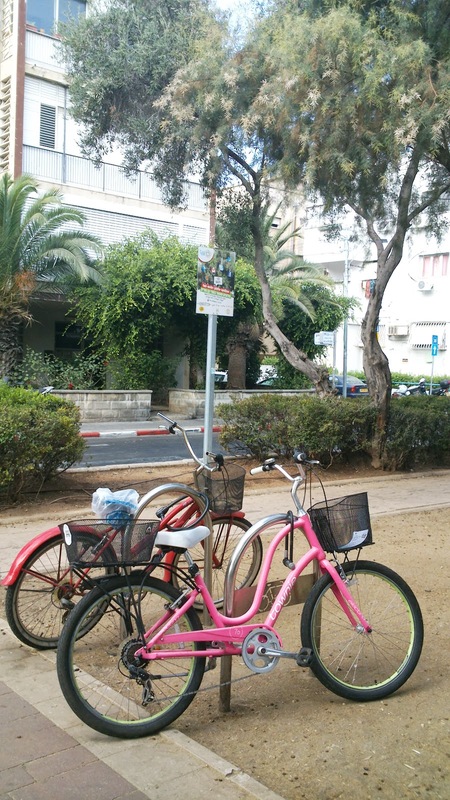 Cycling on David Hamelech (King David) blvd. Today, on my way back from some early morning chores, even though I was in a bit of a rush, I couldn't resist and took some time to walk under Ibn Gabirol's st. arcades. I've already sung praises to the wonders of these arcades - cool and shady in summer, providing a shelter on a rainy day, they are really perfect for a city stroll. And they are also perfect for the window shopping of Ibn Gabirol's stores, that line this long and busy street, and for watching people that walk, cycle, shop, meet, and drink coffee in the many cafes along Ibn Gabirol. "Tsav Kria" - used bookstore near Rabin sq. 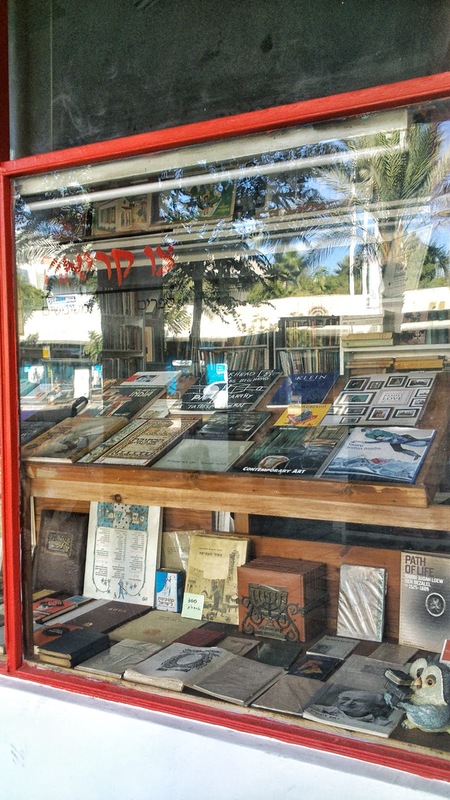 The used bookstore "Tsav Kria" is one of my favorite in the city. It's small but really well organized, with a great book selection and reasonable prices. There's something truly special about the used books - every time I open one, I can't help but wonder about its previous owners - what's their library looked like? What they liked in this book? Had they highlighted any passages or wrote some notes on the margins? I really like finding these notes, these mementos from the previous book owners - to me, it adds so much to the value of the book! I must mention here two books-related blogs that I really like: Bookstore guide is an amateur guide to book shopping throughout Europe. Since I'm a fan of bookstore tourism, I check it up whenever I travel, to see if there are interesting bookstores at my destination. And Forgotten bookmarks is a lovely blog by a used & rare bookseller, who writes about "the personal, funny, heartbreaking and weird" things he finds in those books. 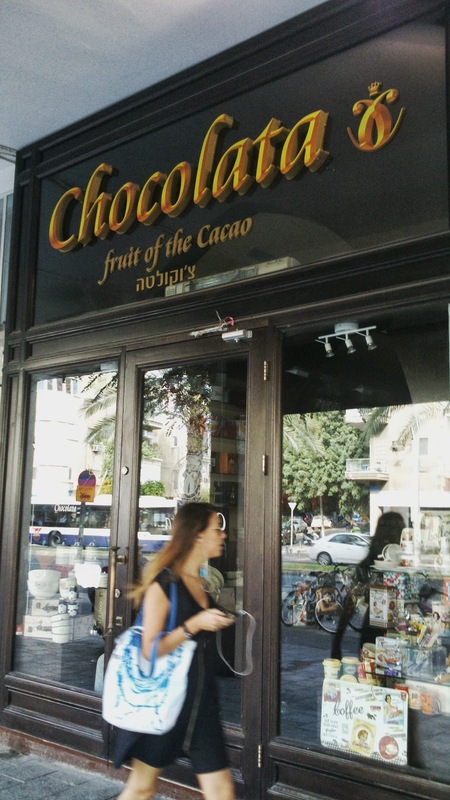 There are so many chocolate boutiques on Ibn Gabirol, that Haaretz newspaper had dedicated them an article suggesting to nick-name the street "Chocolate Boulevard"! Read this nice article for "3 hour chocolate tour on Ibn Gabirol", see my other posts about this pretty special and unique street, and check out Our World Tuesday for more photos, posts and stories from interesting places all over the world. 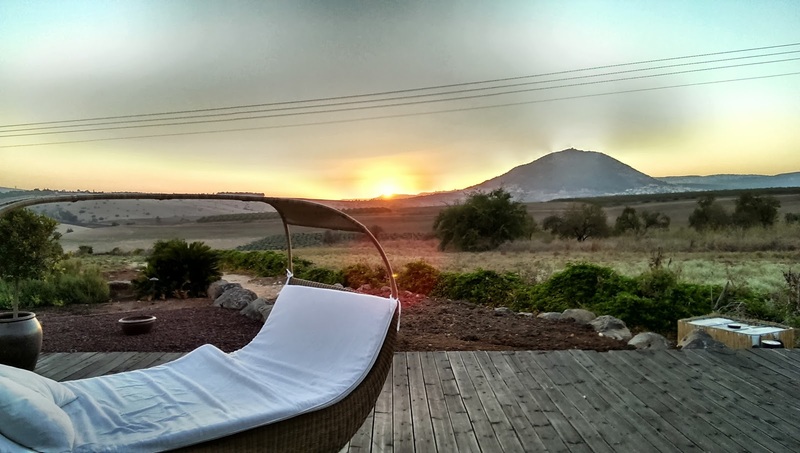 We've spent the Jewish New Year weekend in Kfar Kisch, a small village in Lower Galilee. "What are you doing while you're there? - asked my mom. - Probably taking some walks in the countryside, enjoying the views." Truth is, we hadn't. One of the reasons was that we're not such fans of countryside walks; but another one was the fact that the view from our B&B room was so spectacular, that we basically just spent most of the time simply enjoying it without leaving the premises. According to wikipedia, the Lower Galilee is the southern part of the Galilee, and it's called "Lower" since it is less mountainous than the Upper Galilee. Mount Tabor is one of its tallest peaks. This is what makes the view so especially beautiful: to the west (perfect for sunset watching), you can see a chain of low hills, dominated by Mount Tabor. There's no settlement in view, except for the one at the base of Mount Tabor - and of course there's a church on its summit, since according to Christian tradition this was the site of the Transfiguration. Transfiguration and Mount Tabor are mentioned in one of the most wonderful (in my opinion) poems ever written - "August" by Boris Pasternak. This is one of the poems included in Pasternak's novel "Doctor Zhivago", since its protagonist, Yuri Zhivago, is also a poet... Yuri Zhivago - or Pasternak himself - describes the vision of his own wake. As often in Pasternak's poetry, the hero is at first shaken by the image of upcoming death, but is sustained by his art and his faith... Here's an excerpt from the poem, in Andrey Kneller's beautiful translation (you can find the full text on the translator's site). Across the forest to my wake. -- Transfiguration of Our Lord. Draws to itself observant eyes. Farewell, the gold of festive blessings. 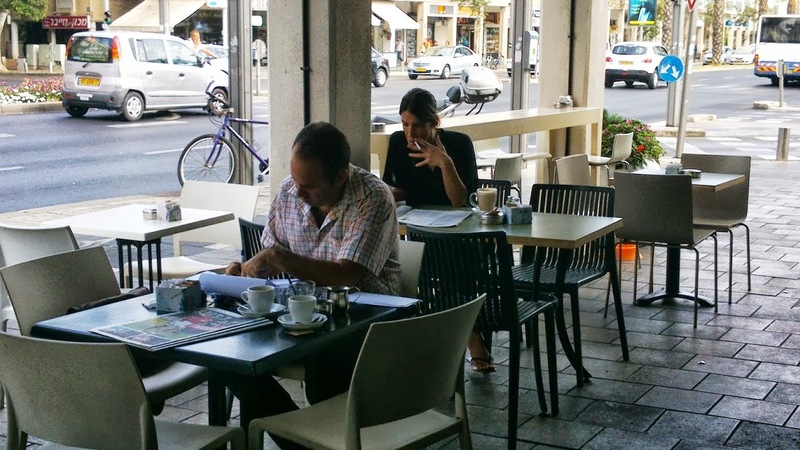 Tel Aviv is a city of marvelous open cafe culture, and it's splendid to see people opening their day in the cafes all over the city. Those who work from home run their meetings and make business calls; those who have a day off just relax and read a paper; and those on the way to the office grab a coffee to go. Each street corner and each morning hour sees its regulars, and some places open as early as 6:30 AM!.. 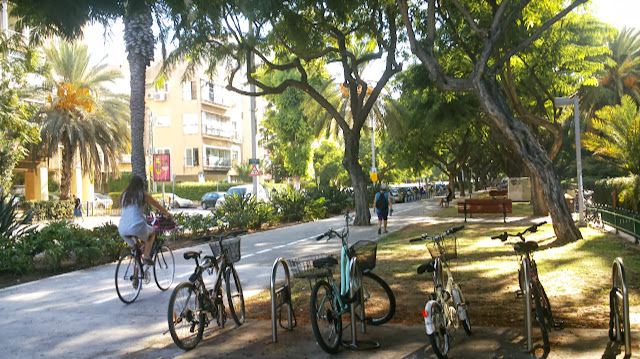 Today I had time for a morning stroll on some awesome Tel Aviv streets - first Ibn Gvirol, then Ben Gurion, then Dizengoff. And the streets were airy and happy, and the cafes filled with patrons. I especially love the open, inviting, integral-part-of-the-city cafe-kiosks (more about Tel Aviv kiosks here and here), like this one on Ben Gurion blvd. The last photo is for today's City Daily Photo theme - pink :) Click here to see more happy pink from around the world. Happy Sunday and happy September everyone! Of all the spectacular Tel Aviv beaches, Dogs beach is probably my favorite. (And I don't even have a dog!) I think it's so special to me because of this extraordinary brotherhood and togetherness between all: couples and families, young and old, dogs and people; all just coexist in peace and tranquility on this (not so large) slice of sand and water. 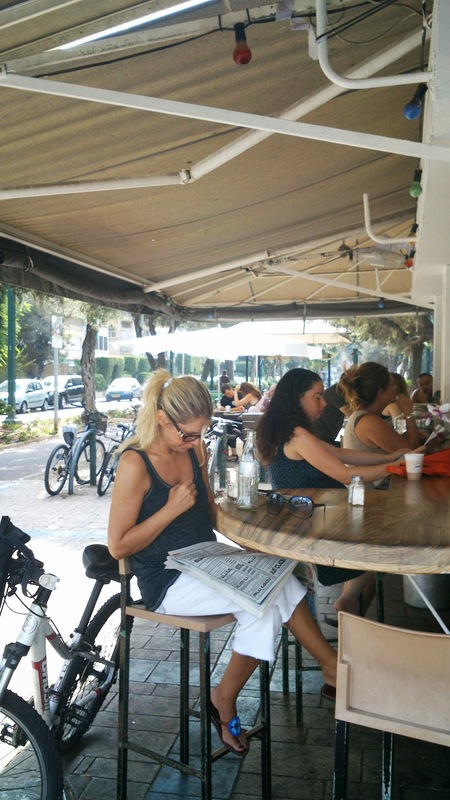 I really like how the sea and the beaches in Tel Aviv are open, inviting and accessible for all, and Dogs beach is one of the great examples of this openness. And yes, the owners can let their dogs run loose and free, and swim, and play!.. A bit of paradox (maybe), but this beach is also really calm and tranquil: not too loud, not too crowded. (Even though it may not seem so on the picture - but it's also Saturday morning in August, when all the beaches are at their busiest!) And (as I already mentioned elsewhere), dogs in Tel Aviv are really cool, friendly creatures. I can't believe it's already the last week of August... summer is flying by so fast! Fortunately, in Tel Aviv we should have already a couple of summery-weather months ahead of us, with many days of sun, and sea, and dogs running free on the warm sand. 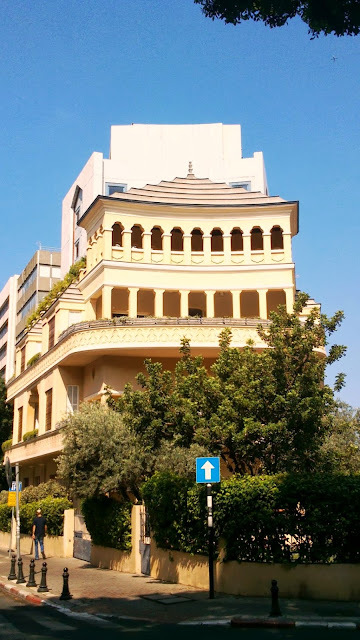 I must have passed tens of times by this magnificent Pagoda house on the corner of Nahmani and Montefiori streets, but until now I never stopped by to take a close look and appreciate its splendor. This building was built in 1925 and renovated in the 2000s. Today this is a private residence. 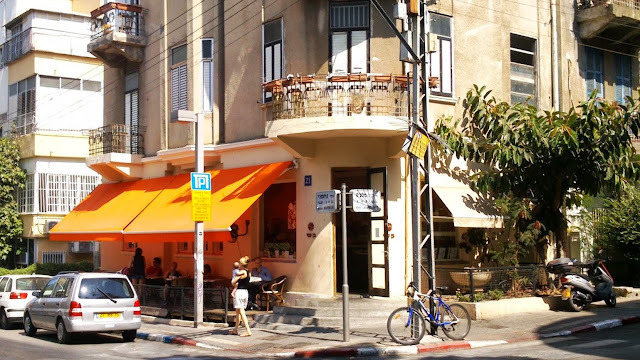 With all the gorgeous old Tel Aviv buildings in a very sad state, this renovation is truly inspiring. In addition to the Pagoda house, from the square you can see a charming "Ben Ami" corner cafe. "Salon d'automne" ("Autumn Salon") is an exhibition of the works of young and innovative artists held in Paris every year for more than a century, since 1903. 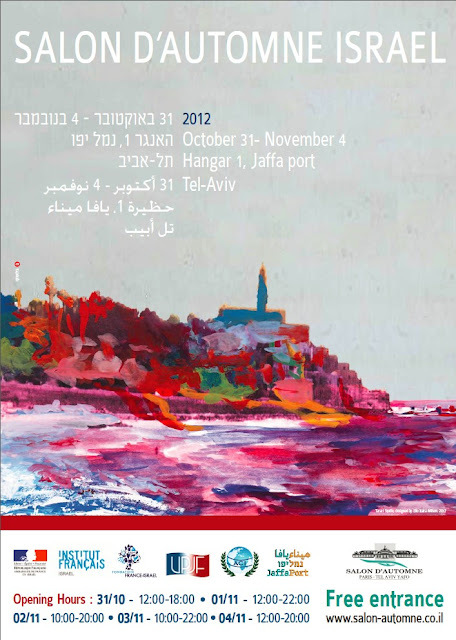 This year, for the first time, "Salon d'automne" will be held in Tel Aviv! I like summer sunsets over Hayarkon river so very much, that I made them a theme for a project for a photography class I once took. (Here's the photo gallery of the sunsets I shoot back then.) It doesn't matter how often I see them, they never cease to fill me with awe. It's also always cooler in the park by the river - just a perfect place for summer evening walk, or a run, or a bicycle ride. I'm a bit busy these days and not giving this blog as much attention as I would want to, but if you want to see some glimpses of Tel Aviv, you are welcome to my "quick Tumblr blog", that I get to update pretty often! Hope you are having a very happy summer! Take a look at Our World Tuesday for more summer pictures from all over the planet. I'm in a bit of a hurry this weekend, but still I managed to go for a sunset watching bicycle ride last evening. And was I glad that I did! Tel Aviv port and the promenade are getting crowded these warm May weekend evenings (what a contrast from this winter evening! ), but still not as crowded as it gets in the summer. The breeze is nice and calm, and the sunset is breathtaking. Posting this quick capture for Sky Watch Friday and Weekend Reflections. Have a great weekend everyone! Aya Korem is a wonderful Israeli singer and songwriter. Last month we saw her performance called "One woman that sings" in Tmuna Theater, a small venue in Tel Aviv's Montefiore neighborhood. Unlike most of her concerts, where Aya performs mostly songs that she had written, "One woman that sings" is a homage to "women in her life", singers and poets, Israeli and foreign, who influenced her life and art. That was a beautiful, touching performance. Sometimes encounters with works of art can influence us more profoundly than "real events" of our lives, and Aya Korem had compiled and presented a beautiful collection of the songs and stories about her encounters with "women in her life". And I was able to relate even more since some of these women are "women in my life" as well.